European and Middle Eastern medieval mythology is populated not only by such famous examples of fabulous beasts as the dragon, griffin, basilisk, centaur, unicorn, and minotaur, but also by many lesser-known yet no less fascinating fauna, including a small furry mystery beast called the mimick dog. It was also known as the Getulian dog, because it was said to originate in the Libyan province of Getulia as well as occurring elsewhere in the Middle East, particularly Egypt. A third name for it is Canis Lucernarius (Lucernarius is Latin for watch-dog). However, to discover the origin of its principal name, 'mimick dog', we need to consult the accounts of this intriguing little creature that can be found in two of the most famous European bestiaries. Namely, Swiss naturalist Conrad Gesner's five-volume Historiae Animalium (1551-1558) and English cleric Edward Topsell's The Historie of Foure-Footed Beastes and Serpents (1658). 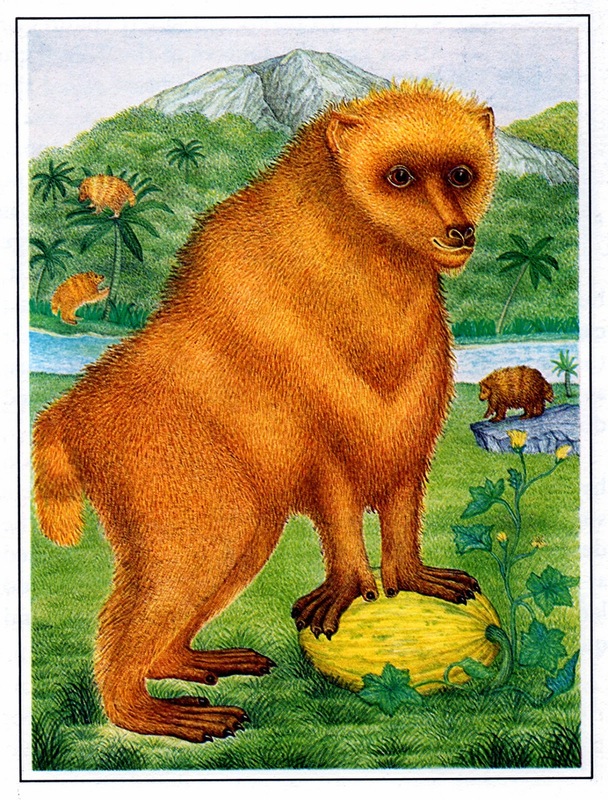 According to their commentaries, the mimick dog is capable of imitating anything that it sees, leading some observers to assume that it must have been conceived by a monkey (which were often termed apes in these bestiaries but were clearly monkeys rather than anthropoids). Moreover, it supposedly resembles a monkey in both wit and disposition, but differs markedly in morphology. Its face is described as being sharp and black like a hedgehog's, with a short recurved body, very long legs, shaggy fur, and a short tail. It is sometimes reared with monkeys, and while doing so it learns to perform all manner of very pleasing and unusual feats. During the time of the Graeco-Egyptian writer-scientist Ptolemy (90-c.168 AD), there were apparently plenty of mimick dogs in Egypt. According to his documentation of them in his scientific treatise Geography, they had been taught to leap, play, and dance when music was played, and they even functioned as servants in the homes of many poor people, where they performed a wide range of tasks for their masters. Any dog whose muddled morphology combined the face of a hedgehog with the body of a monkey would be a wonder to behold, but its talent for mimicry set the mimick dog even further apart from the typical canine creed. Consequently, they were much sought-after by travelling players and puppeteers, who would train them to participate in their performances. One such performance took place during a public spectacle at Rome, attended by the emperor Vespasian (ruled 69-79 AD) and the famous Greek biographer Plutarch (46-120 AD) who became a Roman citizen. It featured an extremely versatile mimick dog that effortlessly imitated the behaviour and cries of a diverse range of different types of dog and other animals too. Its pi­èce de resistance, however, was its own tragic death, after eating some poisoned bread. During this act, it reeled and staggered to and fro like a drunken man before falling down to the ground and lying motionless for quite some time, as if dead. This was followed by its enthusiastic resurrection from the dead at the end of the play, which it executed with great verve, opening its eyes, then raising its head and looking around as if waking from sleep, before standing up and running to its master, its unexpected revival duly delighting the emperor and the other members of the audience. 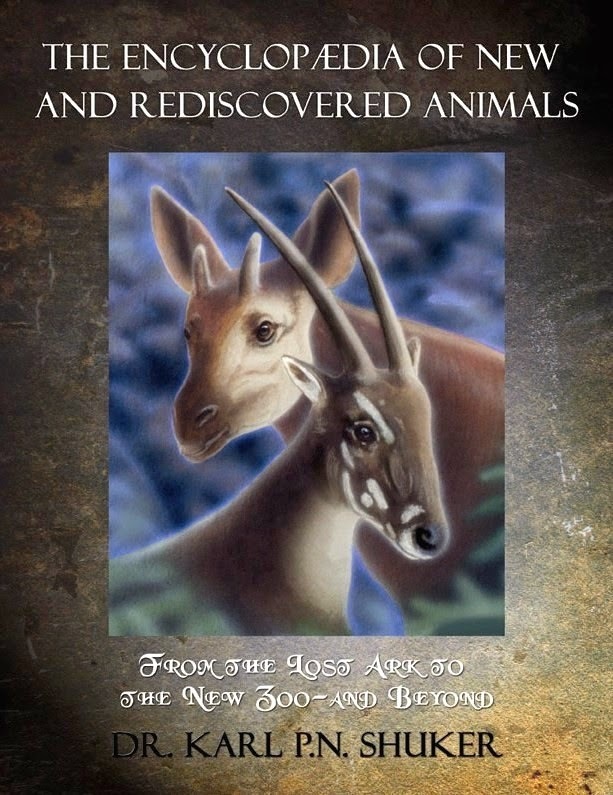 Despite its onetime popularity, however, the mimick dog is largely forgotten today, and even among those few zoologists aware of its history there is no consensus regarding this strange animal's precise identity. Indeed, there is no guarantee that it was actually a dog at all. 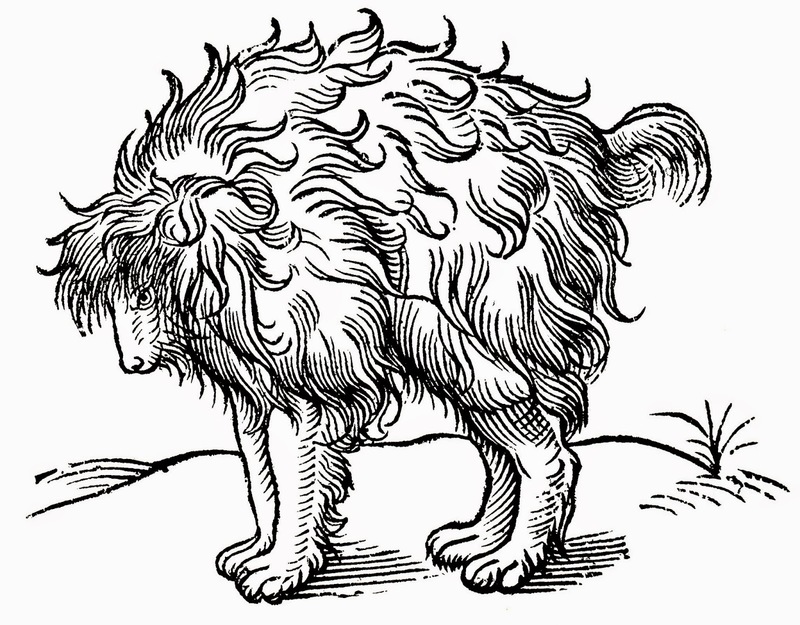 In his book Curious Creatures in Zoology (1890), John Ashton proposed that it was a poodle, but the animal depicted in a woodcut of the mimick dog appearing in Topsell's bestiary (in turn copied from Gesner's) looks nothing like this familiar breed, nor even like some early form of it. In any case, even the cleverest poodle would experience major difficulties in adequately carrying out the diversity of tasks habitually performed by human servants. And needless to say, the suggestion made by some early authorities that mimick dogs were the product of illicit liaisons between dogs and monkeys is untenable for basic genetic and taxonomic reasons. A far more likely explanation for this furry caricaturist is that the mimick dog was not of the canine persuasion at all. Certainly, its gift for accurate impersonation and mimicry readily recalls a monkey. More specifically, its body, long limbs, dense fur, short tail, and slender muzzle are all consistent with baboons. By the time of Egypt's New Kingdom (16th-11th Centuries BC), both the sacred baboon Papio hamadryas and the anubis or olive baboon P. anubis were being imported into Egypt (there was even a baboon-headed Egyptian deity, Babi – the attendant of Thoth). 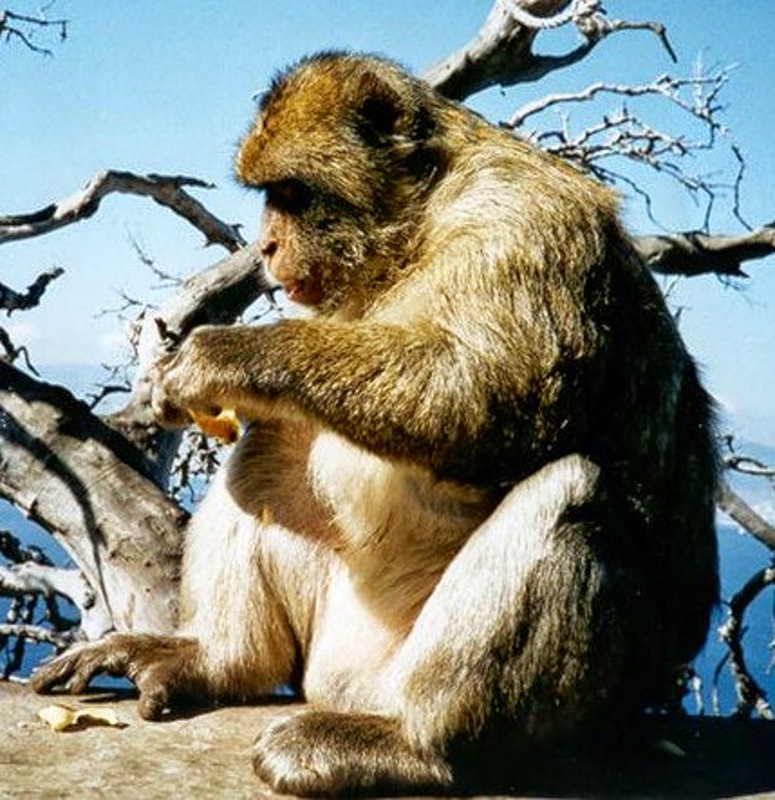 So too was the Barbary ape Macaca sylvanus - not an ape but a near-tailless species of macaque monkey, native to North Africa (including Libya long ago) but renowned for the colony on Gibraltar, thus making it Europe's only present-day species of monkey (it is also the only macaque species outside Asia). 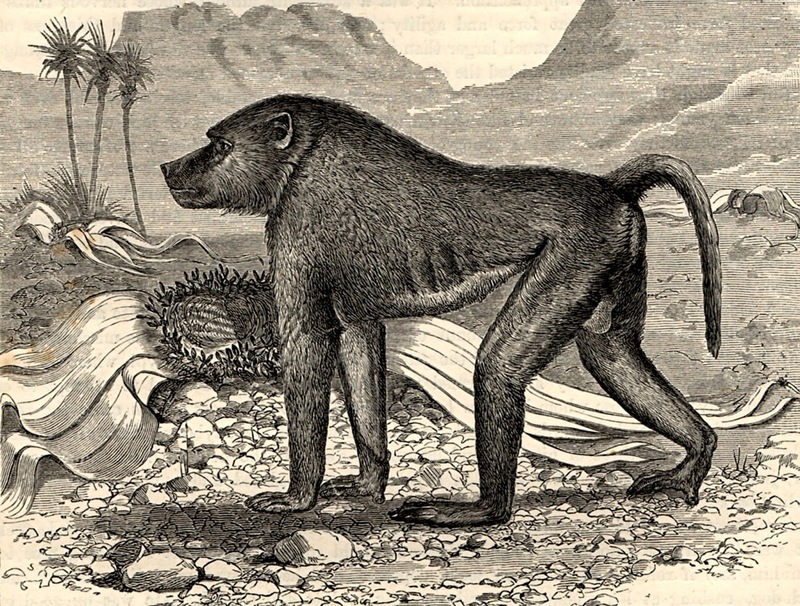 Furthermore, not only were they sometimes kept in Egypt as pets, these primates were also retained in colonies by temples, and buried in necropolises. There are also various depictions of these monkeys acting as servants to humans here, though some portray them carrying out various unrealistic tasks (for monkeys), so may not be reliable sources of evidence. Notwithstanding this, trained baboons accompanying travelling performers journeying northwesterly from Egypt could have reached Greece, Italy, and elsewhere in Europe (even England, as mimick dogs were indeed present here, according to Topsell). Baboons are easily trained to perform tricks, they are often kept as intelligent pets, and sometimes have even been taught to carry out tasks normally reserved for humans. 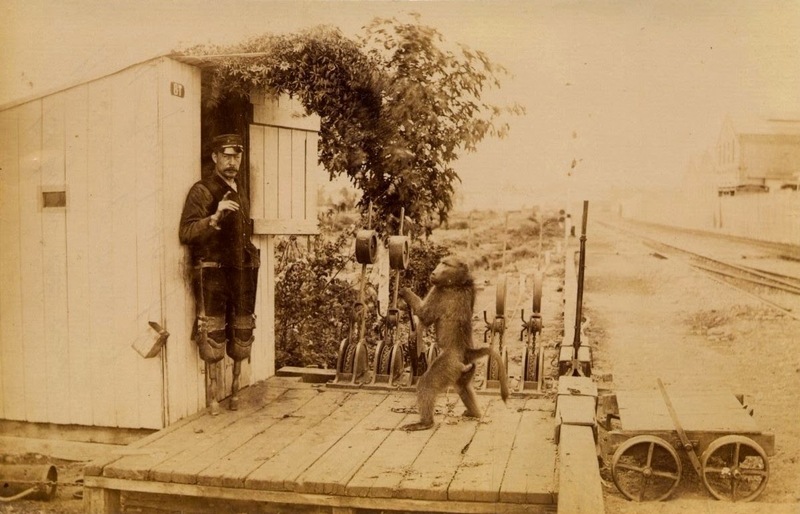 Perhaps the most famous example was a chacma baboon P. ursinus from the late 19th Century called Jack (died 1890), who worked for most of his life as a signalman, assisting his crippled human master, James Edwin Wide, to operate the railway line signals at a small train station in Uitenhage, South Africa. Throughout his amazing career, which spanned nine years, Jack never made a single mistake; moreover, after passing with ease a stringent series of tests set by the authorities in Cape Town, he was actually given an official employment number by the South African government! During the 1970s, another baboon was fulfilling the same role at a railway station near Pretoria, and there was a baboon elsewhere in South Africa whose farmer owner had trained him as a shepherd! 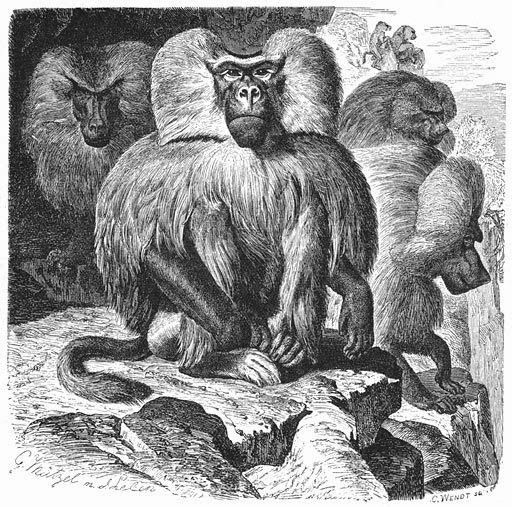 Having said that, however, the creature depicted in the bestiaries of Gesner and Topsell bears no resemblance to a baboon. True, medieval illustrations of animals were often notoriously inaccurate, but it just so happens that Topsell's bestiary also includes a woodcut of what is instantly recognisable as a baboon, accurately depicting its dog-like muzzle, short tail, and even its ischial callosities (rough spots on its protruding buttocks). This provides good reason for believing that the mimick dog woodcut is not a poor representation of a baboon. Nor does it look like the Barbary ape. In fact, the bestiaries' mimick dog woodcut does not recall any type of monkey. At present, therefore, verification of the mimick dog as a baboon remains unproven, but perhaps this is fitting. After all, it would be nothing if not ironic if science quite literally made a monkey out of a creature best known for apeing around! 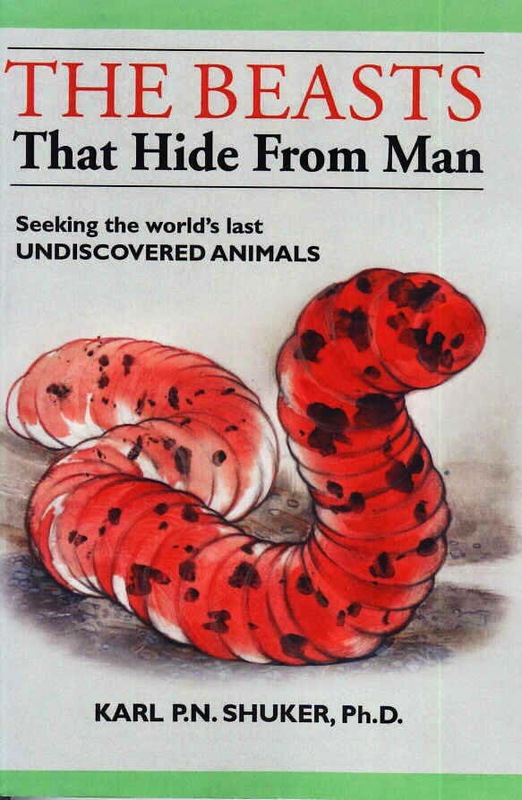 This ShukerNature blog post is expanded and updated from my book The Beasts That Hide From Man. Characterised by their sable-hued pelage, blazing red eyes, spectral nature, and their traditional association with disaster and death, the zooform phenomena known as Black Dogs have been extensively documented. Equally mysterious, but far less familiar, are their pallid counterparts, the White Dogs and fairy hounds. Nevertheless, these canine phantoms are by no means rare. One of Great Britain's most famous White Dogs is Gally-trot, reported in the North Country and Suffolk, which resembles a bullock-sized dog with a white shaggy coat. Gally-trot earns its name from its tendency to chase after anyone who runs away from it, and from its fearsome demeanour ('Gally' translates as 'to frighten'). What may be the same apparition has also been recorded specifically from a marshy pool near Burgh, in Suffolk, called Bath Slough. During the years leading up to World War II, a White Dog was often seen racing across the road linking the Norfolk villages of Great and Little Snoring, and on one occasion an unsuspecting motorist drove directly through it! Equally intangible is the white hound of Cator Common, Dartmoor, which, in one particularly memorable modern-day instance, abruptly disappeared in full view of a lady who had stretched out her hand to stroke it. Even more extraordinary, as brought to my notice by cryptozoologist Jan Williams, is the White Dog reported from Leek Brook in Staffordshire. Just like its Black Dog equivalent, East Anglia's Old Shuck, this particular White Dog has no head! Another Black Dog trait mirrored by certain White Dogs is their association with chains - as demonstrated by the white hound of Bunbury, Cheshire, which is normally observed dragging a length of chain behind it. A few Black Dogs have actually materialised inside churches, and there is at least one White Dog on file with a similar claim to fame. Resembling a ghostly white hound, this preternatural beast reputedly appears inside the church at Pluckley, Kent - not too surprising a locality, perhaps, as Pluckley is popularly deemed 'the most haunted village in England'. Mystery beast investigator Neil Arnold has publicised a fascinating but hitherto little-known, present-day sighting of a White Dog. One evening during the early 1950s, a soldier based at an army camp inside Richmond Park was returning to the camp after visiting London when he noticed that the park's deer seemed unusually disturbed. 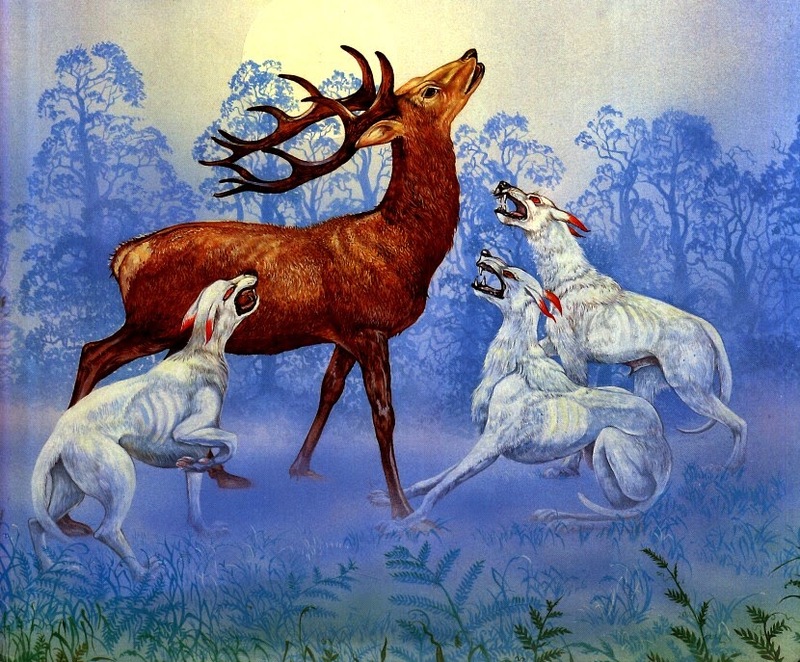 Suddenly, several deer raced by him in a state of great panic, and when he looked behind them he was amazed to see a huge, pure-white hound, of hideous appearance with immense teeth, chasing after them. However, it was no normal, corporeal dog. Instead of running across the ground, this uncanny entity was racing through the air, at a height of about 1 ft above the ground! Although most reports of White Dogs emanate from Great Britain, there are varied traditions elsewhere too. For instance: Lamper, the Hebridean death dog, is white, and runs round in circles to warn of an impending death. 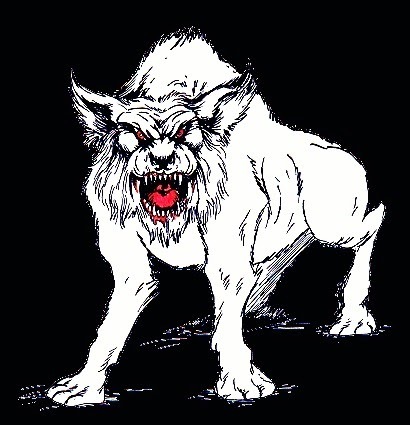 Werewolf lore has it that the loup-garou (French werewolf) can assume the guise of a White Dog. And in Romania, gypsies claim that many cemeteries here are occupied by white spirit wolves, which guard the living by discovering and destroying any vampires that may arise within these graveyards. "On came the hounds - more beautiful dogs I had never seen; as they swept by, more than one brushed against my knees, though I could feel nothing save intense cold. When they were about twenty yards ahead of us, they slowed down, and maintained that distance in front of us till we arrived on the shores of the lake. There they halted, and throwing back their heads, bayed as if in farewell, and suddenly vanished. We knew then that they were no earthly hounds, but spirit ones, sent by a merciful Providence to save us from a cruel death." 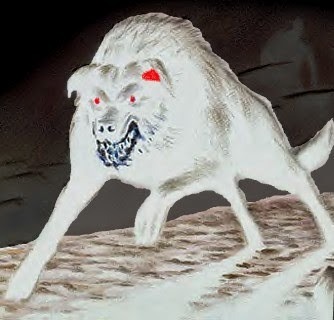 Lancashire's gabriel hounds are phantom dogs that race through the air, rather like the Richmond Park beast, and are sometimes said to be luminous white in colour, but are readily distinguished from 'normal' canine spectres (white or otherwise) by having human heads. Another pack of ghostly White Dogs has been reported near Wellington in Somerset, whose open-mouthed members allegedly emit flame from between their jaws as they race along. This case has been investigated by renowned British folklorist Ruth L. Tongue, who has linked it to the longstanding British tradition of fairy hounds. Also known as hounds of the hill, fairy hounds are said to be the hunting dogs of the Little People, who dwell in hollow hills. And according to Welsh mythology, a pack of these ethereal creatures, known as the Cwn Annwn, was also owned by Arawn, King of Annwn - the Celtic Otherworld. Resembling large white hounds with long slim legs, they are characterised by their ruby-red ears and eyes. Researching Somerset fairy hounds, Ruth Tongue noted a modern sighting near Priddy. The eyewitness was a man who had seen two huge dogs, taller than Irish wolfhounds but with a rough white coat and red ears, walking by him, on the other side of the road, making no noise. According to local lore, he had been very lucky, because if they had walked by him on the same side of the road, or had uttered any sound, he would have surely died. 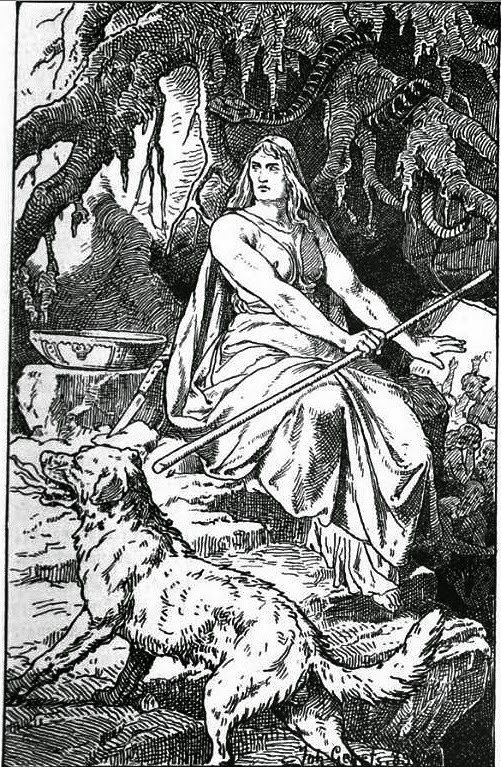 In her book Forgotten Folk-Tales of the English Counties (1970), Tongue included a story recalled in 1917 by a Mrs Foden of Long Mynd, and also known in Cheshire, with a similar variant in Irish folklore. It concerns a labourer's young assistant who was going home from work late one night when he saw a huge dog, larger than a calf, with a rough white coat and red ears, lying in some bushes. Thinking at first that it was a foot-sore foxhound, he collected some soothing dock leaves to wrap around its feet. After collecting them and calling the dog to him, however, he realised that it was "...one of the fairy hounds from the hill who bring death or ill-luck". Although badly frightened, the boy boldly bandaged the animal's paws, then wished it good night before continuing his journey home. Nothing untoward happened to him, but one dark evening in November he was going back home along that same road when a huge demonic goat-like beast confronted him, with glowing green eyes. Transfixed with fear, the boy was certain that he would be killed - when suddenly a huge White Dog with red ears appeared from nowhere and ferociously attacked the goat-beast, enabling the boy to escape. Click here for my own detailed retelling of this folktale in an earlier ShukerNature post. Of course, such tales as this could be dismissed as nothing more than charming but wholly fictitious folklore...except for the fact that such animals are still being reported today. Each year at sunrise on Midsummer Day, a ghostly priest reputedly enters West Kennet Long Barrow, a Neolithic tomb overlooking Silbury Hill in Wiltshire, and is followed by a spectral White Dog with red ears. A similar beast with fiery eyes is said to appear each evening at midnight in a Neolithic burial chamber called the Devil's Den, at Fyfield, also in Wiltshire. 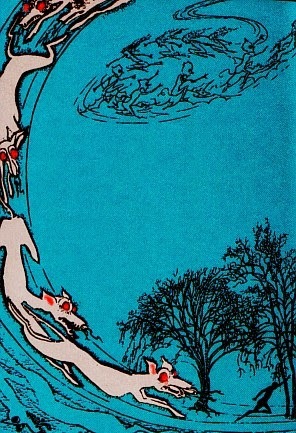 Old traditions die hard, and those featuring White Dogs and fairy hounds are no exception. 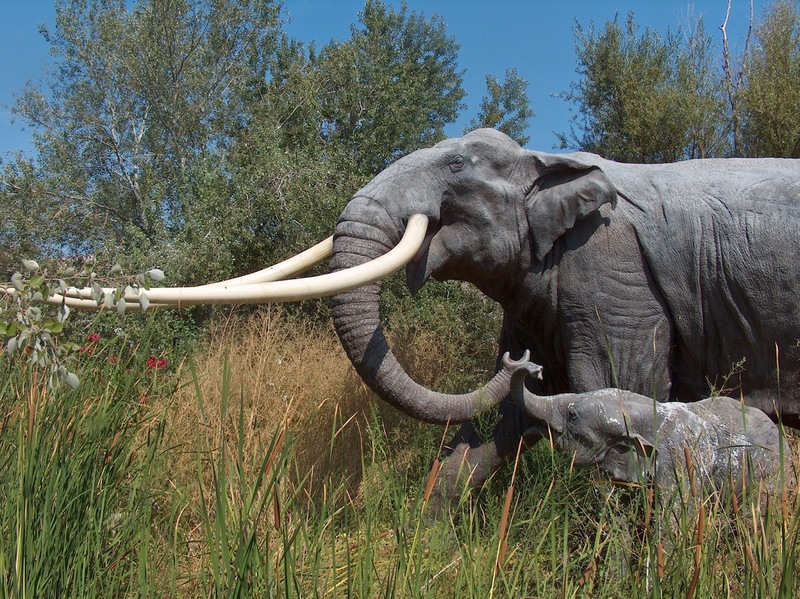 A JUMBO-SIZED REVELATION FROM CHINA - STRAIGHT-TUSKED ELEPHANTS IN HISTORIC TIMES? As recently as 3000 years ago, elephants were still living wild in northern China, which may come as something of a surprise to many people. But something far more surprising concerning them has lately been proposed. It had long been assumed that these were Asian elephants Elephas maximus, because this familiar modern-day species still exists today in southern China. 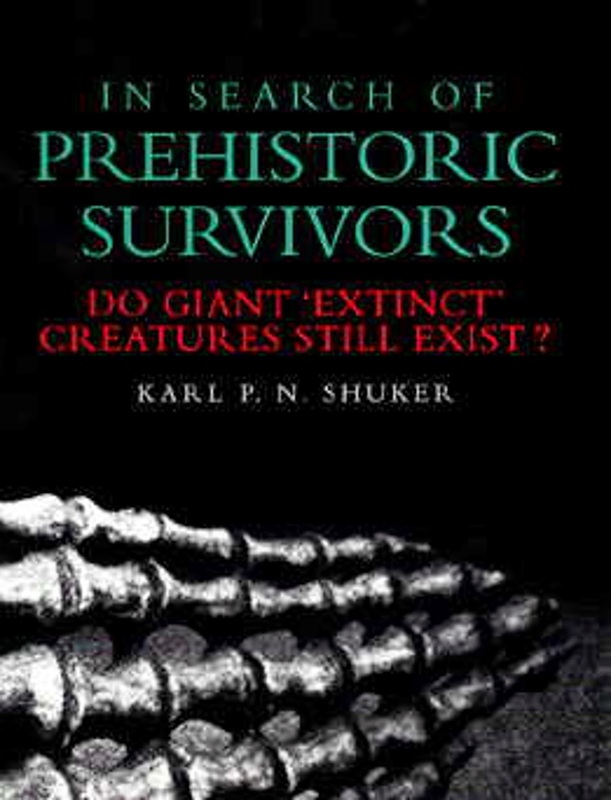 However, researches conducted by a team of scientists from Shaanxi Normal University and Northwest University in Xi'an and from the Institute of Geographic Sciences and Natural Resources Research in Beijing, and published on 19 December 2012 in a Quaternary International paper, sensationally divulged that the northern China elephants seemingly belonged to an entirely separate, ostensibly long-extinct genus, Palaeoloxodon – housing the straight-tusked elephants. Might Palaeoloxodon warrant an entry in my book In Search of Prehistoric Survivors? Until now, China's Palaeoloxodon species (as yet unnamed) was thought to have died out at the Pleistocene-Holocene boundary, approximately 10,000 years ago. However, the Chinese team's findings indicate that it was still alive at least 7000 years longer, into historic times – a veritable prehistoric survivor, in fact. The team's revelations were based upon their re-examination of 3000-year-old fossil teeth hitherto believed to have been from Elephas but now recognised to belong to Palaeoloxodon; and their reinterpretation of 33 northern Chinese elephant-shaped bronze wares from the Xia, Shang, and Zhou dynasties (c. 4100-2300 years ago) whose trunks all had two grasping finger-like digits, whereas the trunk of E. maximus only ever has one, thus suggesting that these bronzes may depict Palaeoloxodon, not Elephas. Not everyone agrees that this partial resurrection of Palaeoloxodon in China is valid, however, with fossil elephant experts Drs Adrian Lister and Victoria Herridge claiming that the supposed dental differentiating features are merely contrast artefacts created by the low resolution of the photographs as published in the Chinese team's paper and that these features do not appear in better-quality photographic reproductions. They also note that cultural and iconographical aspects appertaining to Chinese art at the time of the bronzes' creation might reconcile their double-digited trunks with Elephas after all, not requiring the need to resurrect Palaeoloxodon. 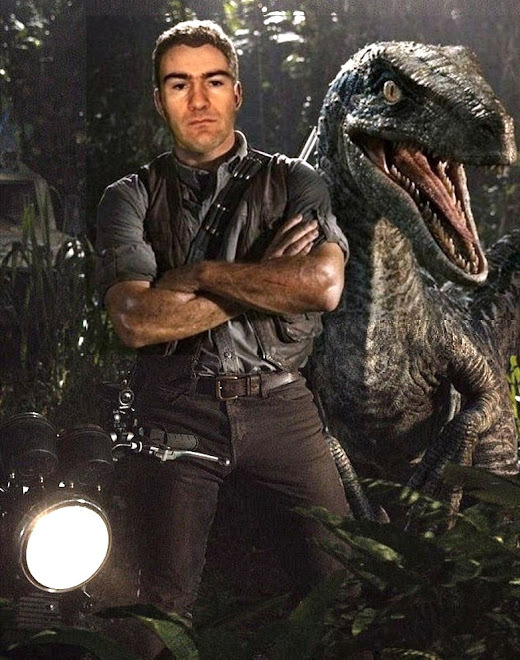 In short, it is likely that this intriguing subject will attract further palaeontological scrutiny and contention for some time to come. Just because a species has yet to be formally named and described by science doesn't mean that it is invisible. On the contrary – in the case of the hairy octopus of Indonesia's Lembeh diving resort off north Sulawesi (=Celebes), it is a veritable online megastar! Since 2008, a number of eyecatching videos and photographs have appeared on several websites, including YouTube, portraying a small species of octopus (body size 1.5-5 cm, arm length 3-10 cm) that varies in colour between specimens from brown or red to white or cream, and is covered in an extraordinary profusion of hair-like skin flaps or extrusions that superficially resemble strands of seaweed. The smaller the specimen, the more flaps it often bears, and when present among genuine clumps of seaweed it is virtually invisible, so effective is its remarkable camouflage. Yet although it remains undescribed by science, this fascinating species is frequently encountered by divers (although in terms of specimen numbers it seems to be rare). Indeed, a page devoted to it on the official website of the Lembeh Resort includes an impressively lengthy list of dive sites where it has been seen (click here), and it has been reported at all times of the year. It has also been reported off Komodo and Ambon. A close-up video of one specimen shows its 'pseudo-seaweed' skin extrusions in great detail, and they are truly astonishing in their verisimilitude. Interestingly, the hairy octopus is not the only example from recent times of a very unusual, distinctive species of octopus to have remained undescribed by science several years after first being reported by divers and swimmers. Two other, very famous ones recorded from Indonesian waters are the mimic octopus Thaumoctopus mimicus and the wunderpus Wunderpus photogenicus, whose remarkable appearance, mimicry abilities, history of discovery, and eventual scientific description are fully documented in my book The Encyclopaedia of New and Rediscovered Animals.